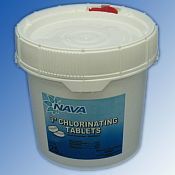 Nava 3" Chlorine Tablets - 25lbs. Nava 3 inch Chlorine Tablets - 25lbs. 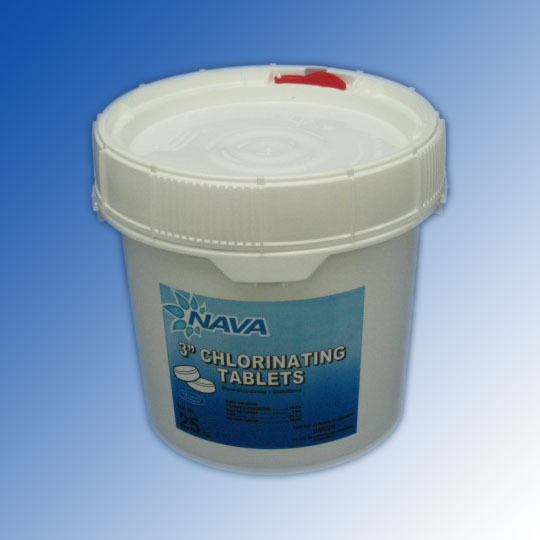 Nava produces the strongest compressed chlorine tablets available. Each tablet has 90% available chlorine. These chlorine tablets start to work killing germs and bacteria as soon as they enter the pool. Stablized to protect your chlorine from the sun's harsh rays means your chlorine will last longer and you save money on pool chemicals. Using Nava chlorine tablets will also require you to use less acid to keep the pH balanced. Enjoy clean sparkling pool water with less time spent cleaning. Nava chlorine is stabilized to also protect eyes and skin, but any chlorine should always be handled with care and keep out of reach of children. Available in 10, 25 or 50lb pails. For use in floating chlorinators or automatic chlorinators. Stabilized to prolong the life of your chlorine.